Can You Bury an Above Ground Pool? A question we hear from time to time is whether or not above ground pools can be installed as in-ground pools. The short answer is yes, but the longer answer involves several conditions. Not just any pool can be buried, and not just in any area, and not just to any shape or depth. First, you need to make sure your above ground pool is built to be buried, as not all are. Of the brands we carry, Radiant pools and the Doughboy Palm Shore model can be buried, either fully recessed or with a semi-in-ground installation. If your backyard has the right composition and configuration, you can choose the installation style that best fits your lifestyle. Note: The Doughboy Palm Shore is the only Doughboy model that can be completely buried AND is backed 100% by warranty. Perhaps the best benefit of a buried above ground pool is getting the in-ground look you want at a smaller price point. In most cases, above ground pools will cost less than in-ground pools, so it may be possible to save money choosing the former over the latter. However keep in mind that you may need to invest in a more expensive in-ground pool pump to pull the water up since above ground pumps are designed to sit below the water level. Radiant pools and the Doughboy Palm Shore are versatile enough to be installed fully above ground, all the way into the ground, or even as a semi-buried pool. It all depends on the style you want and the layout of your yard. A downside to burying an above ground pool as opposed to installing an in-ground pool is you’ll have less flexibility with depth. 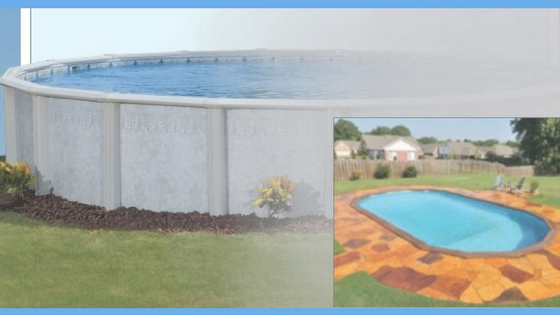 Although it is possible to install a fully recessed or semi-in-ground pool with a deep end, you’ll generally not be able to reach depths an in-ground pool can reach, simply due to liner constraints. A deep end is not out of the realm of possibility, but standard liners can’t stretch infinitely. You may be able to reach your desired depth using expandable pool liners, however. When installing liners, the size and shape of your pool matters, as well. We recommend you consult an expert regarding your options before you make any decisions. Durability is why it’s so important to make sure the pool you intend to bury is capable of being buried. The construction of the Radiant pools and Doughboy Palm Shore is strong enough that they will hold up during installation, filling, draining, maintenance, and more. If you try to bury a pool that isn’t built to be buried, you are going to find yourself facing a lot of expense and a lot of hassle rectifying the situation. We can’t stress enough how important it is to make sure you have the right pool. 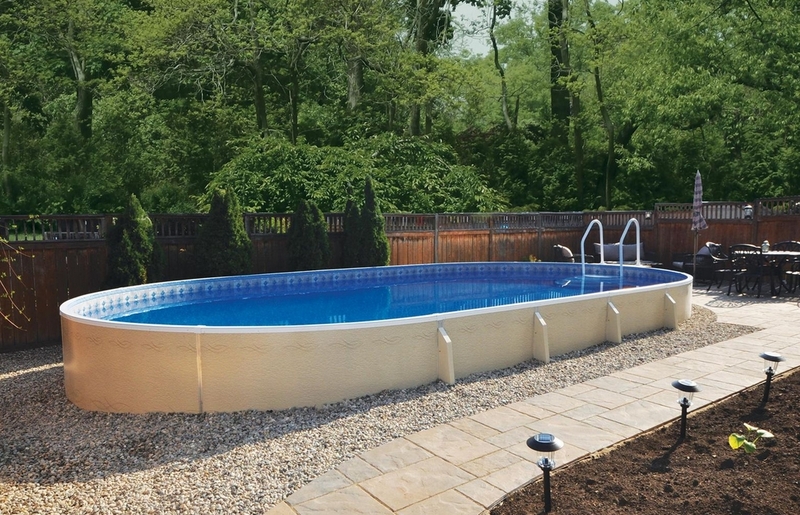 In-ground pools can be built to any specifications. From stock designs to semi-custom to fully custom, you can get whatever you want. 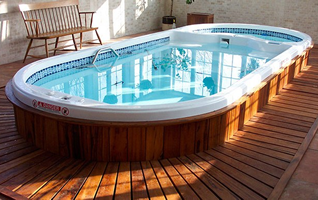 With above ground pools you will have to work within existing parameters. Still, with several of the models available today, you can get above ground pools that look like in-ground pools, designed to your style and your property. Particularly in Michigan, it’s important to know the composition of the soil into which you’ll be burying your pool. If you’re not sure (most people aren’t), contact an expert to help you determine if burying an above ground pool is even an option for you. Should I Bury an Above Ground Pool, or Install an In-Ground Pool? Which type of pool is right for you? As with any leisure activity, it depends on your needs, your desires and your lifestyle. 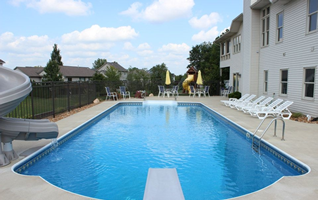 Please contact us with further questions you may have regarding any type of pool, and how we can help you and your family enhance your summer entertainment. Can an Above Ground Pool Have a Deep End? Pool Safety: Fact or Fiction?